All cars manufactured in 1976 or later must participate in a mandatory smog check. San Ramon residents take their smog test seriously because of the dramatic effect excess smog has on the air quality in the Tri-Valley area. If your car predates 1976, make getting your smog checked biennially part of your regular car maintenance at Valley Import Center. Air quality in the Central Valley is something we all should be aware of, so be sure you’re doing your part by getting a smog check. San Ramon drivers know that getting a certified smog test done is simple when they come to Valley Import Center. Make sure you’re up to date on the California regulation regarding smog checks so you can avoid getting a fine in San Ramon. 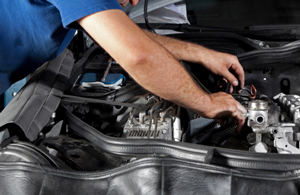 Getting a smog check in San Ramon is a relatively pain-free process. If your car fails a smog test, our car care professionals will suggest the necessary auto repair service to make so that your car will pass next time, which will help you avoid expensive fines. Feel free to call us at our shop or make an appointment online for your car maintenance, and let us know if you’d like us to check your smog as well.